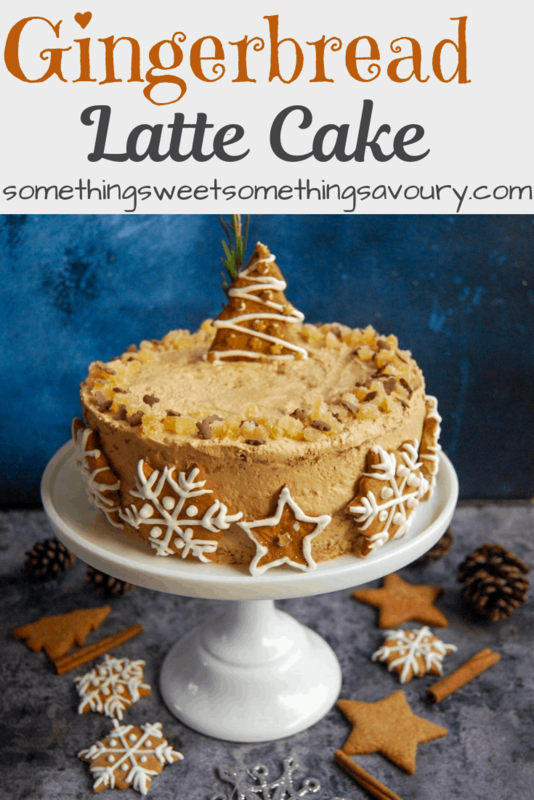 Gingerbread latte cake – my favourite sweet, spicy festive drink in cake form! 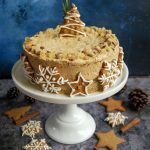 This cake has some very festive flavours going on – ground allspice, cinnamon, nutmeg, ginger and treacle – all the usual flavours you would associate with gingerbread and Christmas! Of course, it wouldn’t be a gingerbread latte cake without adding coffee! It won’t give you a strong caffeine hit – it’s quite subtle but enhances all the other flavours beautifully. Inspired by BBC Good Food, I’ve chosen to finish the cake off with a stunning Biscoff (Lotus) biscuit buttercream. I could eat this icing with a spoon all by itself! It’s SO good. In fact, if you wanted to enhance the Biscoff flavour even further, you could crumble over Biscoff biscuits over the top of the finished cake instead of the crystallised ginger. 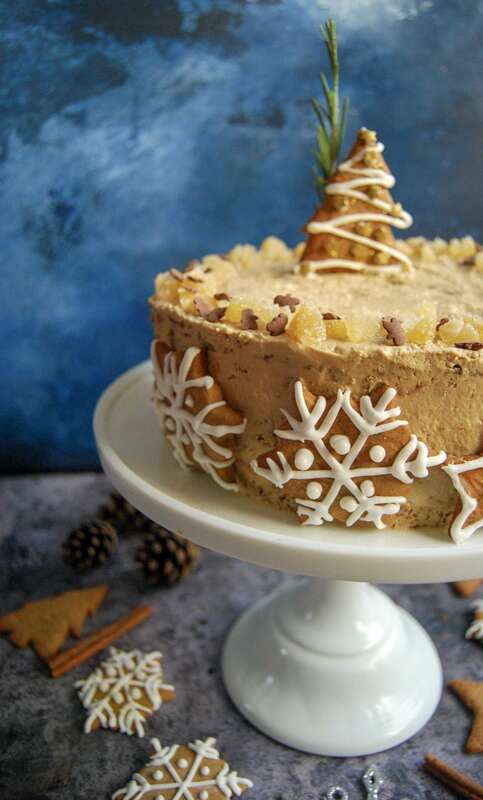 Make a ginger lover’s Christmas by treating them to this gingerbread latte cake! Gingerbread latte cake - my tribute to the sweet, spicy, seasonal drink in cake form! Grease and base line three 20cm loose-bottomed cake tins. If your tins are shallower than 4cm, line the sides with a baking paper collar. Preheat the oven to 180C/160C/Gas 4. Using an electric mixer/whisk, cream together the butter and sugar until light and fluffy. Slowly add the eggs one at a time, beating well after each addition. Beat in the treacle. In a large bowl, sift together the flour, baking powder, bicarbonate of soda and spices. Stir the sour cream, vanilla and cooled coffee together in a jug. Fold the spiced flour and sour cream coffee mixture into the creamed mixture, alternating until all the ingredients are incorporated and you have a smooth batter. Divide the batter between the tins and bake for 25-30 mins or until a skewer inserted into the middle of the cakes come out clean. Cool the cakes in the tin for 10 minutes, then transfer to a wire rack and leave to cool completely. Once the cakes are completely cool (and if you don't need to ice them straightaway) wrap in cling film and store for up to 4 days, or they can be frozen for up to 2 months. Using a stand mixer or electric hand whisk, beat the butter and half the icing sugar on high speed until very smooth. Add the remaining icing sugar, biscoff spread and milk and beat on high speed again until very light and fluffy. Beat in the treacle and continue to mix on high speed until very light and fluffy. Place one of the cooled cake layers on a serving plate or cake stand. The cakes are quite fragile, so don't be too worried if they break a little - the icing will cover it and no-one will know! Spread a layer of buttercream evenly over the sponge, then top with another layer. Spread with more buttercream, then top with the final layer. Using a spatula, crumb coat the entire cake. Don't worry about being too neat here - this step "locks" the crumbs into the cake. Place the cake in the fridge for 20-30 minutes. Remove the cake from the fridge and coat with a second layer of buttercream icing, using a long straight edged cake smoother to smooth out the buttercream if a smooth finish is desired. Decorate the cake with gingerbread biscuits, finely chopped crystallised ginger and a sprig of fresh rosemary for a festive finish! Those little gingerbread men sprinkles are so precious! So cute! Love the sprinkles! Thanks, those sprinkles are my favourite! This is such a tempting cake! I love gingerbread lattes too and also have the syrup at home so I can make them myself for a treat so having the flavours in cake form would be even better. Oh i love how you have decorated this – it looks fantastic. The gingerbread on the edge are so cute! Gingerbread spices, coffee and biscoff…wow all in one what a burst of flavors. Lovely festive cake, wish I could have a slice. Your cake is absolutely beautiful! Love the cookies around the sides! Thank you – they are so good aren’t they? This cake went down extremely well at work yesterday ? Such tasty sounding festive flavours! This would be very popular at any gathering. Thank you so much Ceri ? Thanks Mayuri, I wish I could send you a slice! Thank you so much Heidi ? Thank you Cat – it went down very well at work this week ? Oh my days this is one of the most beautiful Xmas cakes I have ever seen! You are so very clever. I too could eat Biscoff spread by the spoon. It is just the perfect combo with ginger and coffee….squeal! Be fab to see it over at #BakingCrumbs if you have five mins. Have a great Xmas. 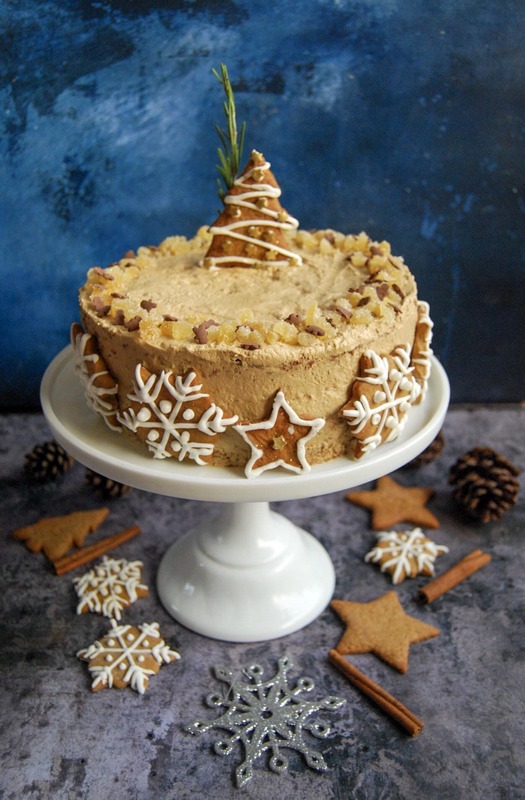 This cake looks gorgeous and I love the combination of gingerbread spices and coffee! Thank you for bringing it to #CookBlogShare! What a stunning cake for Christmas!! Thank you Jo! ? I absolutely love gingerbread latte and also make it at home in December – I figure it saves me a fortune, but if I’m in town I go and order one anyway so…?